There is one rivalry in the Simpsons world that we haven’t exactly explored quite yet, and it may seem a bit surprising that we haven’t after eighteen episodes. We’ve seen these two interact before, but now we are going to get an actual episode about their conflict. 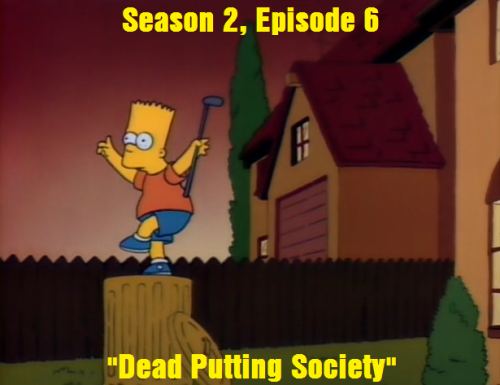 Ladies and gentlemen, it is time for a battle between the Simpson family and the Flanders family; in perhaps one of my all-time favorite Season 2 episodes, Dead Putting Society. I have no intention of starting a discussion on politics here, but I do hope all of you, American citizens, went out to vote this week. After all, you don’t want a person like Mr. Burns in charge, do you? So, last week we had a very appropriate episode to celebrate the Halloween holiday. This week, we have another episode that’s very appropriate, time-wise, to what the US is currently going through with the mid-term elections going on. It’s interesting how starting Season 2 so late ended up being thematically appropriate to the current schedule of events huh? It’s almost like I planned it that way (I really didn’t, don’t give me that much credit). There is one holiday that the Simpson family never seems to miss a beat with and that holiday is none other than Halloween. Every season, starting with this season, has had a Halloween special and it has become a bit of a tradition with the all the writers and producers. It’s a time where they can all come together, pitch some scary story ideas, come up with some interesting parodies, bring the aliens Kang and Kodos out of retirement, and just in general have fun with creating some non-serious and non-canon storylines. It’s not just for the writers’ benefit though, as the Halloween specials are quite popular with the Simpson viewing audience too. In a countdown I watched many years ago of the most favorite Simpson episodes of all time, there were many Treehouse of Horror episodes featured in the Top 10 list alone, which shows how recognized and how loved these spooky stories are. 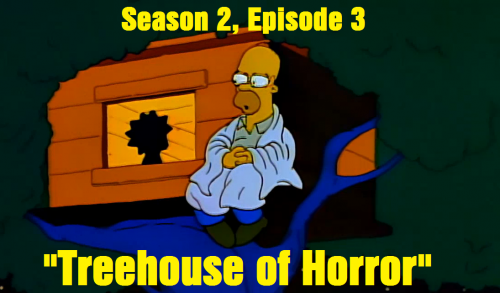 So today, in the spirit of Halloween, we are taking a look at the very first Treehouse of Horror. 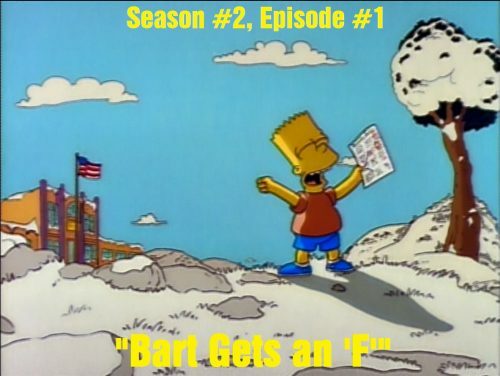 Ladies and gentleman, it is time to take the long-awaited dive into Season 2 of The Simpsons for this retrospective. It’s been over a year since I took a look at the final episode of Season 1, and I do not feel like making you guys or myself wait any longer. Season 2 is a very iconic season for me; mainly because it was the season where I first started watching the show and are the earliest episodes I remember watching as a kid, aside from the Christmas special. 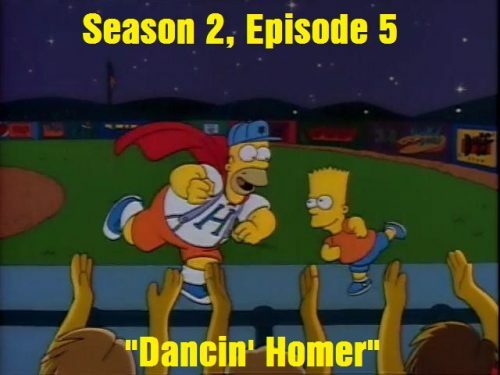 My parents had a video cassette that had a number of Season 2 episodes on it; from Dancin’ Homer, Dead Putting Society, Bart the Daredevil…lots of episodes that I have pretty much grown up with and episodes that are very iconic or memorable to me. 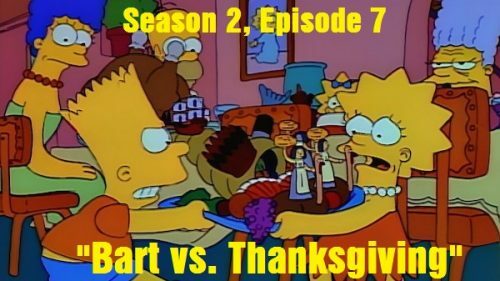 I wouldn’t say that Season 2 is the best season of the show; in fact, most Simpson fans consider Season 2 to be the bronze age of the series (episodes that are indisputably good, but not amazing). Season 2 is probably the most nostalgic for me though as I’ve seen a lot of these episodes a number of times and could more than likely identify most of these episodes from a still image alone if provided to me. I have a lot of fond memories of this season and I very much look forward to re-examining the era and seeing how these episodes still hold up today. 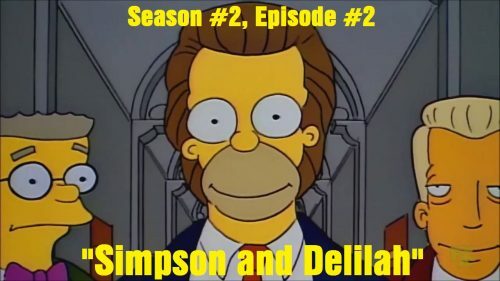 Hello Simpson fans, SlimKirby here and about ready to start Season 2 of the Simpsons Retrospective I started last year. I know it’s been awhile since I’ve done anything with this series, but I’ve been very busy with making videos, streaming, and being part of the Link to the Past Randomizer tournaments, but I’ve been on a bit of a Simpsons kick lately (especially after the Hit & Run revisit on my Youtube channel) and felt like it was a good time to pick this back up and watch some more Simpsons episodes. However, before moving on straight to Season 2, while I was in the process of finishing Season 1, I mentioned making another post where I would rank all the Season 1 episodes in order of favorite to least favorite. 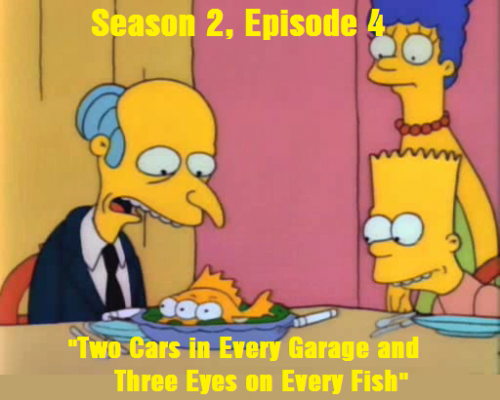 So to officially close out Season 1, and do one final recap of the season as a whole, I present to you my final ranking of all the Season 1 episodes for the Simpsons television show. It’s time to enter the world of Zelda yet again, but this time with a two-for-one special! After the success of both Ocarina of Time and Majora’s Mask, Nintendo knew the Zelda train should continue on the Game Boy Color, and with the additional success of Pokemon and their strategy of creating multiple versions of essentially the same gameplay concept, the Oracle games were born! This is the first of the Oracle games I will be covering; Oracle of Seasons! I’ve been wanting to do Wind Waker for awhile now, but before I officially go on to tackle that beast, I wanted to get the Oracle games out of the way first, just so I can continue the Zelda series in the order of game release. I don’t have the most experience with playing the Oracle games, but I do enjoy the gameplay system set up by Link’s Awakening and thought it would be a good series of games to do in the chill-down period of 2018. I will be covering Seasons first and then Ages following it. After Mega Man 8, Capcom spent some time away from the Blue Bomber to work on the X-series and other games that they were currently trying to promote. Convinced he was forgotten about, the world was surprised to find that in 2008, Mega Man would be returning to form and out of what felt like a retirement, and thus Mega Man 9 was born! What’s Dr. Wily up to this time? Mega Man 9 was a game I was not completely sure how I would be able to play until Capcom revealed a very convenient collection that was coming out to current-gen consoles; including the Nintendo Switch, a system I was very glad I owned at the time of that particular announcement. Because of this collection, I was finally able to get my hands on both Mega Man 9 and Mega Man 10 without any worry of having to buy DLC and having a single, convenient place to play all of the classic Mega Man games.